Here’s a quick guide on how to cook brown rice as well and how to use some of the varieties. With its nutty taste and chewy texture, brown rice doesn’t fade into the background of dishes like white rice does. Once you switch to brown rice, there’s no going back! 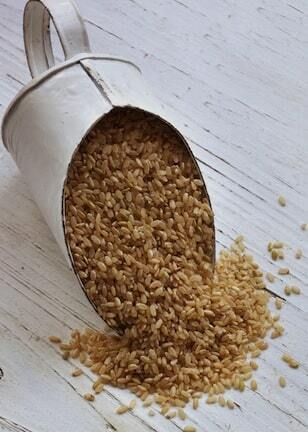 Nutritionally, brown rice is far superior to white, which has had its valuable hull and germ removed. 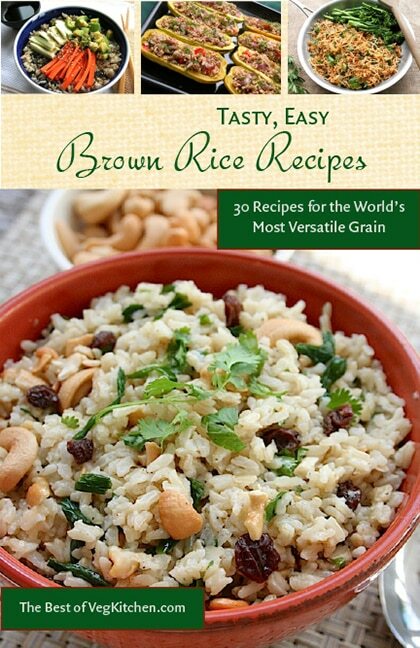 For a wide range of delicious and easy brown rice recipes, visit our Brown Rice Recipes page. Learn more by going to Top 10 Health Benefits of Brown Rice. Here are the basics on how to cook brown rice; there’s not much to it! First, always rinse rice well. Don’t just run some water over it in a sieve — put it in a bowl with plenty of water and swish it around with your hands. Method #1: Cook until liquid is absorbed: The amount of water recommended for cooking long- and medium-grain brown rice varies depending on the source, from as little as 1½ parts water to as much as 3 parts water per 1 part rice. I’ve always preferred 2 1/2 parts water to 1 part rice. For example, 2 1/2 cups water to 1 cup rice. Combine in a medium saucepan with the water. Bring to a slow boil, then lower the heat, Cover (leave lid ajar) and simmer for 30 minutes, or until the water is absorbed. If the rice isn’t tender to your liking at this point, add 1/2 cup additional water and continue to simmer until it’s absorbed. With this method you need not measure. Cooking rice this way is quite common, and actually traditional, in many Asian countries. First, rinse well as instructed above. Combine the raw well rinsed rice with about 4 to 5 times as much water in a roomy pot. Or more — just not so much that the water will boil over. Bring to a rapid simmer, then lower the heat and cover (leave the cover slightly ajar). Simmer gently until the rice is done, 30 to 35 minutes. Drain in a fine sieve when rice is done. If you’d like to make more use of brown rice, and want easy, tasty recipes right at your fingertips, consider our Tasty, Easy Brown Rice Recipes pdf e-book, part of our affordable e-book series. 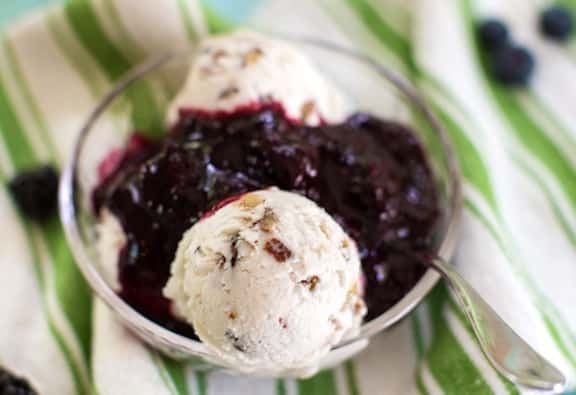 With 30 of our most popular recipes and 20 full-color photos, you can print out this concise guide or view it right on your computer. When purchased in bulk, brown rice is very economical. It stores well for several months, provided that storage conditions are consistently cool and dry. I like to keep mine in mason jars. 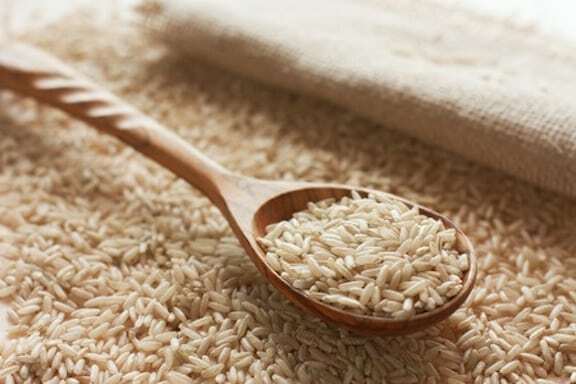 Most natural-food stores also offer organically grown brown rice at a slightly higher price. The only drawback to buying brown rice in bulk is the occasional presence of mealworm eggs and the subsequent moths that hatch from them. If brown rice is left unrefrigerated during warm, humid months, it can become quite a hatching ground, sending annoying, yet perfectly harmless tiny gray moths flying out of your grain jar when opened. The way to minimize the problem is to rinse your rice very well in a fine sieve before cooking it and to refrigerate it during the summer. Be assured that distributors as well as retailers do their best to avoid selling buggy grains. Brown rice is high in fiber, low in fat, and very easy to digest. It provides a good range of the B vitamins, and minerals, notably phosphorus, calcium, and potassium. 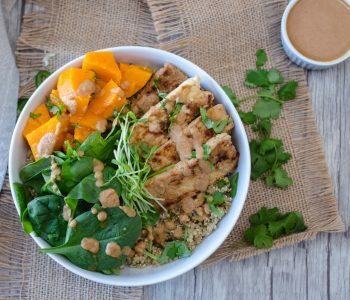 At 7½ percent protein, brown rice is not as high in protein as some other common grains, such as quinoa, millet, oats, and barley, but it’s not insignificant. To arrive at white rice, the bran, polish, and germ of the original rice grain are removed, leaving only the starchy white endosperm. White rice contains only about one-third of the vitamins and fiber, one-half of the minerals, none of the vitamin E, and 80 percent of the protein. To add some nutrition back in, white rice is often enriched, with iron and three B vitamins added back, but it’s still a shadow of the overall nutritional value of whole brown rice. Brown rice is available in a variety of forms, but the differences among the types are culinary rather than nutritional. When deciding which to buy, keep in mind how you plan to use the rice. 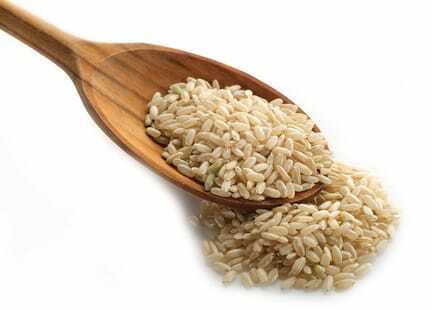 Long-grain brown rice cooks to a firm, fluffy texture and the grains remain separate when cooked. This texture and the mild, lightly nutty flavor make long-grain brown rice a good all-purpose rice. It’s especially good in pilafs, rice salads, and as a bed for vegetable and bean dishes. Medium-grain brown rice cooks to a fluffy texture like long-grain, but is slightly more tender and has more of a nutty, sweet flavor. Medium grain rice is also good as an all-purpose rice and works especially well in baked goods, griddle cakes, and as a stuffing for vegetables. Short-grain brown rice, whose kernels are almost round, cooks to a denser, chewier texture and is sweeter than both long-grain and medium-grain brown rice. 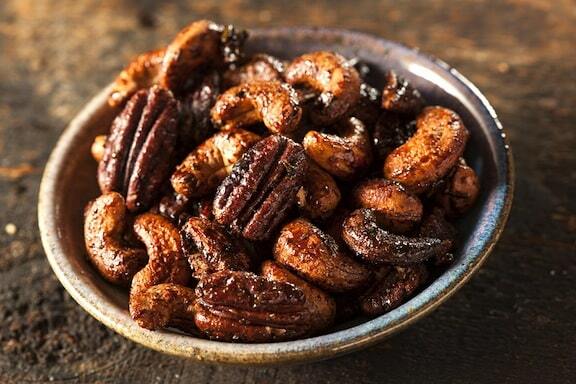 If it is cooked to more than a just-done consistency, it becomes sticky. It’s a great choice for using in rice puddings and, like medium-grain rice, may also be used in baked goods and griddle cakes. 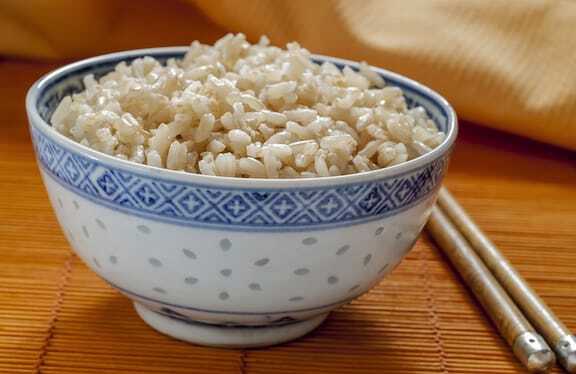 Glutinous brown rice is a variant of short-grain rice. Its name refers to its texture and not literally to gluten, which it does not contain. Glutinous rice is a fairly common offering in natural-food stores as well as Oriental groceries (though in the latter, it is much more likely to be refined). Alternately called sweet rice or sticky rice, glutinous rice is a much-used staple in Japan and other Southeast Asian countries. It is used in the making of sushi, rice balls, sweet puddings, and mochi cakes. A long-grain rice that originated in northern India, Basmati’s special appeal lies in its exceptionally nutty flavor and enticing fragrance. The Basmati rice used in traditional Indian cookery is usually refined, but a whole, unpolished version is available in natural-food stores. Brown Basmati is grown in California under conditions approximating those of the plant’s native Punjab region. California Basmati is sometimes labeled, appropriately, calmati. Brown Basmati is generally available in bulk and is a bit more expensive than ordinary brown rice, but not so much as to make it prohibitive. It is especially appropriate to use in Indian recipes, enhanced with aromatic spices. Basmati may be substituted in any recipe calling for long- or medium-grain brown rice. Cook it exactly as you would those types of rice. If you’re concerned about arsenic levels in rice, read some information and tips here. 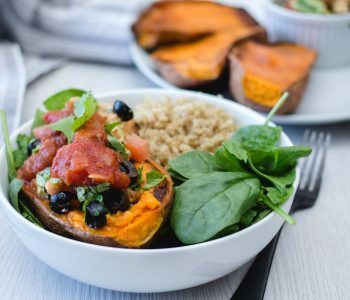 Explore our collection of delicious Brown Rice Recipes. That’s a great tip, Ruchama. 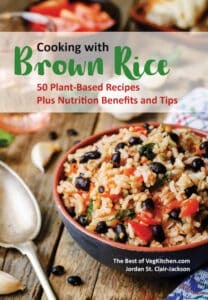 I don’t think I’ll be able to make brown rice again without doing as you suggest! I looked up your site to find an answer to why the Basmati rice that I just cooked had all these worm-like things mixed in. It’s the first time that I cooked brown Basmati rice on it’s own. Before I mixed it in with different times of rice. Yikes, I wouldn’t have seen the worms then! I thought that I’d washed it really well letting the tap water run through the raw rice in a sieve before cooking it. I see now where I went wrong. Thank you Ruchama for your tip about letting the rice sit in the water so that the worms float to the top. They sure do look like the rice. I guess that applies to all rice. Thanks again for sharing your information. I’ve been reading about the need to soak all whole grains, including brown rice, to reduce/neutralize phytic acid. How important is that? Hmmm, very nice advice about rice, later I will try it with my Redmond 4500 multicooker. Wow thanks guys for this tip, been having brown rice without noticing this but great tip indeed. Any thoughts on Black Rice? Does it have the same “Worm” issues the basmati does? 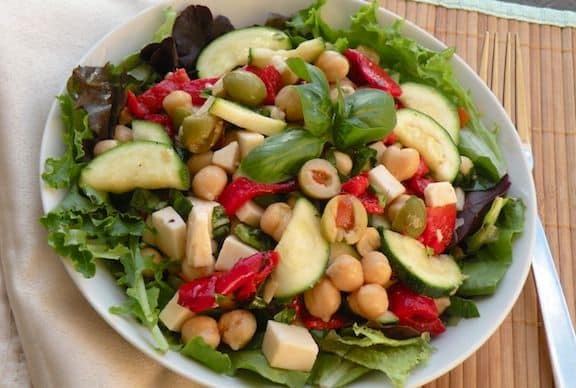 I bought some from a supermarket deli as a salad, it was very good, which prompted me to purchase a package to make my own. I hear it’s very good for you as well. Thanks for all the great tips and recipes! John, black rice is delicious and looks very dramatic on the plate. Since it’s a whole grain rice, I imagine it has similar health benefits to brown rice. I haven’t had the same grain moth issues with it as I’ve had with other grains, but that’s not to say it never happens! Wow “black rice” never had of it before,hope i can have it here too in my country Angola and the Gambia! I think it’s important to rinse or wash everything you cook. I’ve lived in places where you had to pick “things” out of your food occasionally and became a diligent food washer. Additionally, I have to mention that US food supplies are becoming increasingly suspect and frequently contaminated–often very dangerously so; so I wash all grains and soak all produce in grapefruit seed oil to cleanse it of bacteria and wildlife before it gets to the stove or the table. If your water supply isn’t safe, the GSO soak will still clean your produce and cooking will kill anything dangerous left over from rinsing your grains. we belong to a group of people whose staple diet is rice only.,which means rice is eaten thrice a day.But since the most easily available and clean looking rice is the white variety it is the most commonly used for the last 2 or 3 decades.Most households cook the rice in pressure cookers.Its only now that people have slowly become aware of the benefits of traditional brown rice and the best mode of cooking which enhances immunity increasing properties of brown rice. Give Karmin professional rice cooker a try, is phenomenal!